The Residences, JLT by Dubai-based Signature Developers is on the fast track to completion, with its show apartment opening doors for potential buyers. Designed by Dubai-based studio VB Design, the show unit is located on the 26th floor of the 46-storey mixed-use development. The contemporary interiors of the unit are inspired by the stunning landscape, colours and modern architecture that surround The Residences, JLT, and reflect a relaxing yet sophisticated haven. The tower has a distinct façade with glass pods, resulting in different layouts for each apartment, giving residents the flexibility to design the space as per their preferences. The show home features bespoke pieces to emphasise the panoramic views offered by the pod. The apartment is over 3,000 sq ft, with three luxurious bedrooms boasting exquisite furniture pieces from Italian brands such as Giorgetti and Flexform. The expansive master bedroom includes a walk-in closet, custom-made desk and lounge area with day bed, offering vistas of the Dubai Marina. A bespoke sideboard with a built-in vanity faces the bed, with Calaccata marble used to contrast the bed’s wood. Alongside, the cosy family room is ideal to relax in and enjoy a private theatre experience. The living room features spacious entertainment areas, complete with a bar counter, suitable for hosting both intimate and large gatherings. The minimalistic downlights accentuate the 3.6-m ceiling height, further enhancing the views. The high ceilings also allow the use of bold texture and pendant lights, giving the apartment a harmonious look and feel. “As you enter the apartment, the view takes the main stage and the furniture has been placed in a way that allows you to appreciate it from every room. We have designed the alcove using colours and textures suitable for a plush and comfortable home, to showcase that it can be modified for a professional, couple or family,” said Vanessa Bilbao, founder and creative director, VB Design. The apartment’s kitchen is made of modern quartz stone countertops, rich wood and glass cabinets. It is fully equipped with the latest European appliances including an integrated gas with oven, refrigerator, dishwasher and separate washer-dryer. While, the lavish bathrooms feature Kohler fittings, rain showers and designer accessories. A separate powder room is also available. “Recent reports indicate that there has a been a resurgence in demand for completed or close-to-completion properties in Dubai. We agree with this trend as it is essential for potential buyers to see and experience the property before making an investment decision,” said Raju Shroff, director of Signature Developers. 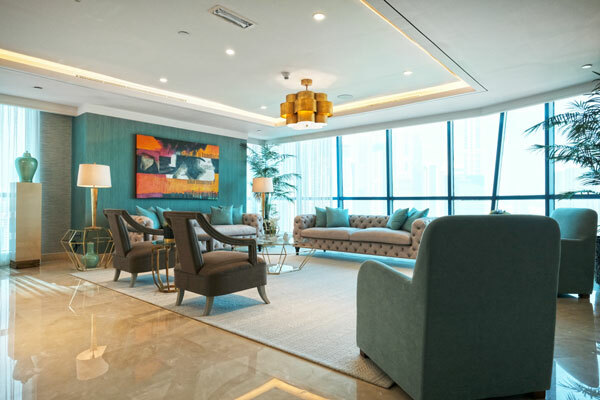 “The show apartment at The Residences, JLT is designed to ensure potential residents get the feel of living in the apartment before buying it,” he added.